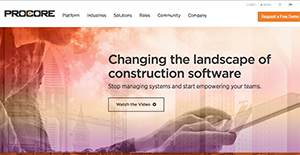 Procore is a construction management system that gives you a centralized hub to connect your people, devices, and applications seamlessly. By offering a unified platform, you can easily view your most critical data and empower standardized operations. This, in turn, makes it easy for you to gain vital insights for making data-driven decisions and projections for your construction projects. Users handle all types of construction projects including retail centers, university facilities, apartment complexes, office buildings, industrial plants, and more. Procore was launched in 2003 and is designed on three fundamental ideas: the vendor listens to customer problems, develops easy-to-use solutions for these problems, and ensures clients are able to use the products immediately. Procore’s team works with users to create new features and build the software. After the team understands clients’ needs, their design and engineering squads create intuitive technology to help customers achieve their goals easily. Procore’s user-centric product development makes the software simple to use. This enables quick implementation, widespread adoption, and greater return on investment. Procore facilitates unlimited collaboration enabling you to work with anyone, from anywhere, in real time. It is a collaborative and mobile all-in-one platform designed to streamline construction project management. The software offers what you need to standardize your processes. Plus, the vendor provides reliable customer support. Procore provides access to unlimited users at no extra cost. You can bring your entire project team on board including third-party consultants and subcontractors. Projects start and end with drawings. As the interactive center of project management, drawings can be marked up and attached to related documentation such as RFIs and submittals. Procore’s Android and iOS apps deliver information to the builders in the field, with or without an Internet connection, ensuring team members stay updated on current plans. Procore’s open API enables integration with other systems. This includes reporting software, storage software, scheduling software, accounting software, and more. You can view your project from the same perspective while being in different locations. Keep teams in diverse locations together using the power of mobility. It enables your teams to remain connected and communicate effectively from the field to the corporate office to the job site trailer. Procore enables your team to access all the information they need, with instantaneous tracking and real-time updates. The software helps your teams stay in sync, even when they aren’t together. This means more teamwork, less rework, and better project margins. Features include Project Directory to connect and communicate with team members, Email Tracking to streamline project email communications, and Integrated Project Scheduling to stay on budget and on time. Procore is a drawing-centric application. It places everything your team needs (photos, punch lists, RFIs, submittals) into the current drawing set to enable every team member to access and use them when they need it. Procore offers unlimited user licenses to enable everyone to be part of the conversation. You can create a truly collaborative environment with unlimited seat licenses and real time accessibility for all project team members. From bidding to completion, you can keep your project up-to-date and your team informed so that no change goes unseen. Procore is designed to grow with your company. It is built to integrate with other platforms with one login and unlimited connectivity possibilities. Project Directory – Store all contact data for project team members and vendors, and enable permissions to control data access. Sage 300 CRE Connector – Align project management and accounting by integrating with Sage 300 CRE. If you are considering Procore it might also be beneficial to check out other subcategories of Best Building Information Modeling Software - BIM gathered in our base of B2B software reviews. Since each enterprise has unique business wants, it is sensible for them to desist from seeking a one-size-fits-all ideal software system. Needless to say, it would be useless to try to find such an app even among market-leading software solutions. The smart thing to do would be to jot down the various vital aspects that need consideration such as required features, budget, skill levels of employees, company size etc. Then, you should do your research thoroughly. Read some Procore reviews and look into each of the other solutions in your shortlist in detail. Such in-depth homework can make sure you weed out ill-fitting applications and select the system that offers all the elements you need for business success. How Much Does Procore Cost? We realize that when you make a decision to buy Construction Management Software it’s important not only to see how experts evaluate it in their reviews, but also to find out if the real people and companies that buy it are actually satisfied with the product. That’s why we’ve created our behavior-based Customer Satisfaction Algorithm™ that gathers customer reviews, comments and Procore reviews across a wide range of social media sites. The data is then presented in an easy to digest form showing how many people had positive and negative experience with Procore. With that information at hand you should be equipped to make an informed buying decision that you won’t regret. Very easy to use, understand, and rationalizes work, but a bit expensive. What are Procore pricing details? What integrations are available for Procore? Pros: Procore is great choice, it does everything well and it is highly intuitive and I like that they are making the software even better. I’m using it on my iPhone and it has great set of features so I can do my job easily. I can see that lot of people are joining the community of Procore which is great thing. Our clients and designers like the idea that we work through Procore and lot of people are starting to implement it. Cons: I’d like to see detailed data from our accounting software so our project managers can get all the data they need. Pros: Can't find anything good to say about this software. Other than maybe their sales staff that have suckered people into buying this. Cons: There is no ease of use on this Software, bidding portion is horrible. Almost every drawing I have downloaded does not read right. Once entered you cannot amend vendor emails without deleting and recreating the contacts.....Support is not helpful only directs you to videos and articles for you to fix the problem yourself. Updates to budgets made it worse to work with. Standard support response is it can't be done we are working on it please send feedback. You can sign up today, without any experience in the industry. Kind of like Procore.